Taste buds are arranged like the inside of an orange, with 50 to 150 cells all lined up next to each other and each of those cells has what's called a taste hair that pokes out of the top. The hairs are geared to tune into the presence of a particular chemical and when they do, they send a signal to the brain that says, hey, you're eating something sour, or sweet or whatever. Thousands of taste buds are found, not just in our tongues, but also in the roofs of our mouths and in our throats. We used to think that different tastes, like salty or sweet, could only be sensed by buds on specific areas of our tongues. But now we know that each bud has receptors for all five tastes, sweet, sour, salty, bitter and umami. 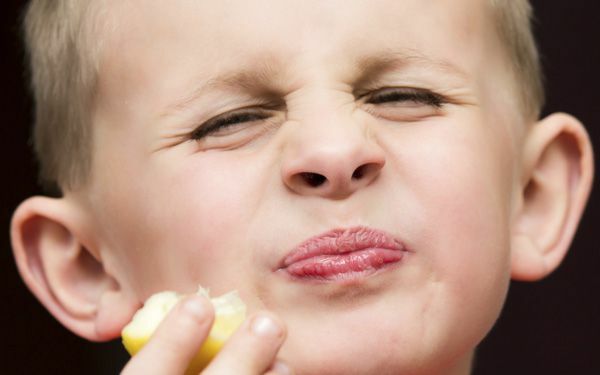 Combined with our sense of smell, taste buds help us survive. We steer clear of bitter tasting, poisonous and rotting food and instead eat our nutrient-rich morsels of sweet, salty or savory goodness. Tastes are based on chemicals. The text states, "Taste buds have 50 to 150 cells all lined up next to each other and each of those cells has what's called a taste hair that pokes out of the top." The text also states, "The hairs are geared to tune into the presence of a particular chemical and when they do, they send a signal to the brain that says, hey, you're eating something sour, or sweet or whatever." One taste bud has receptors for all five tastes. That's why we can react to something that taste bitter. The evidence from the text explains how our taste buds react to different tastes and how that is based on chemicals. Tastes are based on the chemical in the item you eat. The text states that we have thousand of taste buds on our tongue, to tell if something is sweet or sour. The text also states that we have taste buds in our throat and in the roof of our tongues. The evidence from the text explains that we have a lot of taste buds, and they help us survive from telling us if something is bitter or poisonous. Tastes are based chemicals. the text states that our tongues are like oranges and made up of a bunch of cells the text also states that every one of our tongue cells can distinguish between what taste is which, not just a certain area. Our tongue has receptors for all 5 of the different tastes: bitter, sweet, sour, salty, umami. Tastes are based on chemicals. The text states that particular chemicals will tune into the hairs on the top of your taste buds and send signals to the brain , telling you what your tasting. The text also states we avoid certain foods that have chemicals that make the food bitter or rotten. This evidence from the text explains that taste depends on the chemicals that our receptors will send to our brain, telling us what we are tasting or if we should even eat that food. I'm not sure what umami means, but I think its cool that taste buds are all over our mouth and not just our tongues and that there are so many of them. That's really cool. This is something i always wondered about. I didnt even know that we have taste buds at the roof of our moths and our throats. I think this a really cool artical. I never knew how taste buds work like that. I think this will inspire people to study more about this. This artcile tells alot of facts about the topic. Thanks for the great Artical. Ms. Clarkson it is amazing how you don't have taste buds on just your tongues they are in your throat and how we have 50 to 150 cells lined up to each other. This was pretty interesting to read, I was really surprised that taste buds are almost relevant to the anatomy of an orange. Also, the fact that the hair on our cells are what attract tastes; it is pretty interesting.